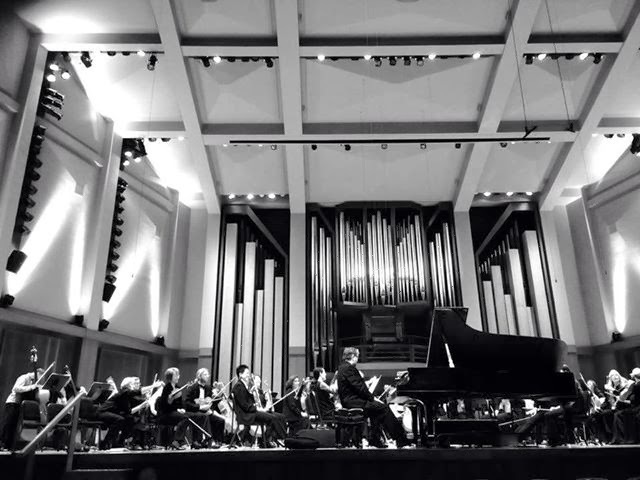 As most of you know, I play with the Seattle Philharmonic, a local community orchestra. The group has played their concerts at UW's Meany Hall for decades and were disappointed to learn last spring that the university had decided that no non-UW groups would be permitted to use the hall while UW is in session. We learned this rather last minute, after our date requests had already been submitted for this season. We were able to work our last two concerts into their spring break and after they're out for the summer, but the first two needed to move elsewhere. 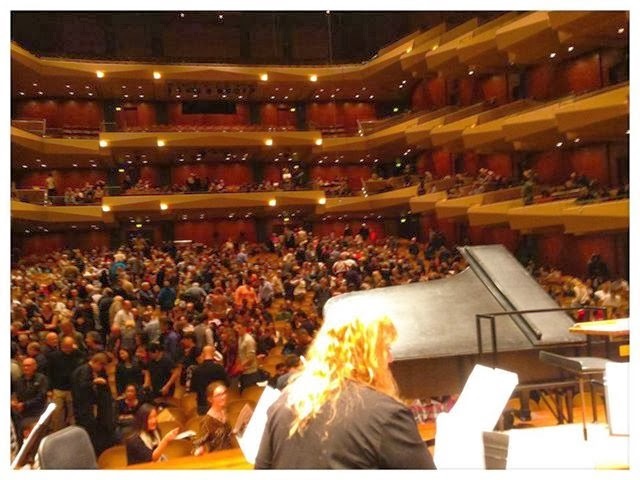 Apparently (I really have no idea what options are available around here), the only other viable option that would give us a hall as good as or better (in this case better) than Meany Hall would be to use Benaroya Hall (where the Seattle Symphony plays). I have yet to make it to a Symphony concert (or any other program held at Benaroya), so I'd never been to the hall at all. Yesterday was our first concert there and it was pretty awesome. I was a little nervous - mostly that everyone else would get nervous and the whole thing would flop. There was some pressure on us all as Benaroya costs our orchestra significantly more than Meany does. We needed this concert to go really well so that people would want to come back and hear us again. And we needed to sell a lot of tickets to this concert to be able to pay for it. In the end we had about 1500 tickets sold, pretty well filling the floor and the first tier, and I believe more tickets than we typically sell when we play at Meany. We weren't even planning on opening up any of the tiers initially, so we were pretty excited when the people at Benaroya asked if we could. And it was a perfect pre-Halloween concert. Rachmaninoff's Isle of the Dead, Hermann's Concerto Macabre from "Hangover Square" (a pretty decent film actually and the concerto itself is really awesome), Liszt's Totentanz, Chopin's Funeral March (orchestrated by Elgar), and Mussorgsky's Night on Bald Mountain (the Stokowski/Fantasia version), with Gounod's Funeral March of the Marionette for an encore. The piano solos were superb and I really liked the Rachmaninoff. Not everything went perfectly - to be expected when you're playing in a hall you've never played in before and everyone's still getting used to it, but overall it went really well. When people made mistakes they seemed to cover them pretty well, and the audience seemed to really enjoy it. I think it'd be fun to do a Halloween-themed concert every fall - there's plenty of death-themed music out there, so it wouldn't be too hard to come up with different programs each year. A good way to start out the season - hopefully our Scheherazade-themed concert in January goes as well or better! It seems that most of the stuff that happens there (especially the symphony) is quite pricey. I'll definitely go to the symphony one of these days, just doubt it'll be any time soon. Seattle is treating us well. I think we're all quite content to have this be our final destination. So excited to hear about your concert. Thanks for sharing. I would love to have been there!